A light aircraft which crashed on the Queen's Sandringham estate was stored outside for months and its engine had corroded, an inquest was told. Pilot Nigel Dodds, 58, and passenger Valerie Barnes, 73, from Gateshead, died of multiple injuries after the Piper PA-28 came down in marshland near Wolferton, Norfolk last September. The Air Accidents Investigation Branch (AAIB) said the plane's engine failed. 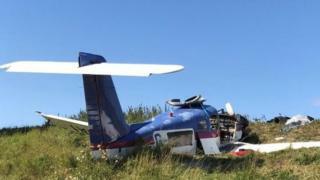 The owners had not been aware the plane had been stored outside. AAIB investigator Robert Vickery told Norfolk Coroner's Court the aircraft was owned by a syndicate to share costs and that this was "quite normal". He said the plane was rolled outside at Newcastle between November 2015 and July 2016 when it was not being used, adding he did not know who rolled the plane out. The plane crashed into an old sea wall after the engine failed during a flight from Southend to Newcastle, which was the final leg of a journey home from Menorca where retired company director Mr Dodds had a home. He had transmitted a Mayday call while flying over The Wash, the estuary between Norfolk and Lincolnshire, stating he had a "very rough running engine". He turned the plane back to the coast and told an emergency controller he could not reach the nearest airfield, stating: "It's gonna be a field." The AAIB crash report concluded the plane had likely stalled at a low height, from which there was insufficient height to recover, during an attempted forced landing following "catastrophic engine failure". In a statement the family of Mr Dodds described the deaths as a "tragic accident which resulted in two good friends losing their lives". The family added they were "devastated" by the loss to both families but "satisfied" with the inquest findings which concluded the pair died as the result of an accident.